If you are looking for a high quality electric pencil sharpener powered by AC, USB or battery, we have a good choice for you. Plug in to the wall, connect to USB interface, or use the batteries, you can use our pencil sharpener wherever you are and whenever you want. Do you feel awkward when you need a paper clip but you just couldn't find it on your messy desk? Don't be upset, we have a good idea for you. Let me introduce our unique electric pencil sharpener with storage function to you. ● Rock Solid Durability - Stainless Steel Helical Sharpens 4000 times without wearing out. ● 3 Tiers Swivel Tower Sorters-Can store your tiny office supplies. Keep your desk neat and tidy! ● Really Sharp Tip- If you are a fan of sharp tip, this is your type. ● Multiple Power Sources- Ready to sharpen all your pencils anytime and anywhere. ● Kid & Adult Safe Technology - Ensures your pencil sharpener won't operate if any single component is missing. ● Backed by a Lifetime Satisfaction Guarantee - the only thing cooler than this electronic pencil sharpener is knowing that you're getting a great deal on a must-have item that'll outlast every other. Maybe you will be surprised that our pencil sharpener doesn't have auto stop feature. This is because we want you to choose the sharpness of the pencil. An auto stop pencil sharpener only has one sharpness choice you might not like, while ours makes your pencil nib totally customized. 【100% MONEY BACK GUARANTEE】: We truly want you to be happy with your pencil sharpener and our professional customer service will do whatever it takes to ensure your 100% satisfaction. We are offering free replacement or refund within 12-month warranty period. If the Amazon return window is closed, send an email to afmat@outlook.com. We will make things right beyond your expectation. 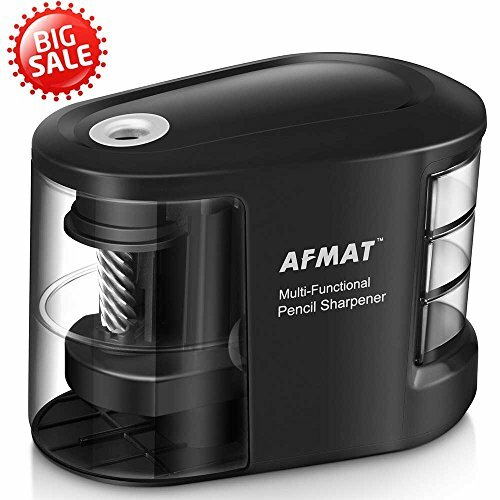 【GUARANTEED TO LAST Crafted from High Quality Materials】: The AFMAT battery operated pencil sharpener gives you up to 4000 times of sharpening without wearing out. With the Heavy Duty, ultra-durable high- grade stainless steel helical blade it takes only 3 seconds to sharpen. Never replace a dull blade again! 【THE BEST CHOICE!】: Whether you are an artist, teacher, student, or businessman, the AFMAT pencil sharpener is the best choice for you. The combination between the unique design and the high-quality materials make it perfect for commercial use, classroom, executive use, desktop or office atmosphere. Space saving design fits comfortably on any size desk. 【DESIGNED FOR PERFECTION!】: Our unique rotating spiral drill design ensures the perfect point every time, never get an uneven tip. This Professional pencil sharpener ideal for No. 2 and Colored Pencils (Drawing, Coloring). Use it as a battery operated pencil sharpener with 4 x AA Batteries (not included) or an electronic pencil sharpener via AC power adapter (included). 【3 Tiers Swivel Tower Sorters】: This pencil sharpener has a unique design of 3 tiers swivel tower sorters. They can store paper clips, staples, small erasers, thumb tacks, etc. Keep your desk neat and tidy!